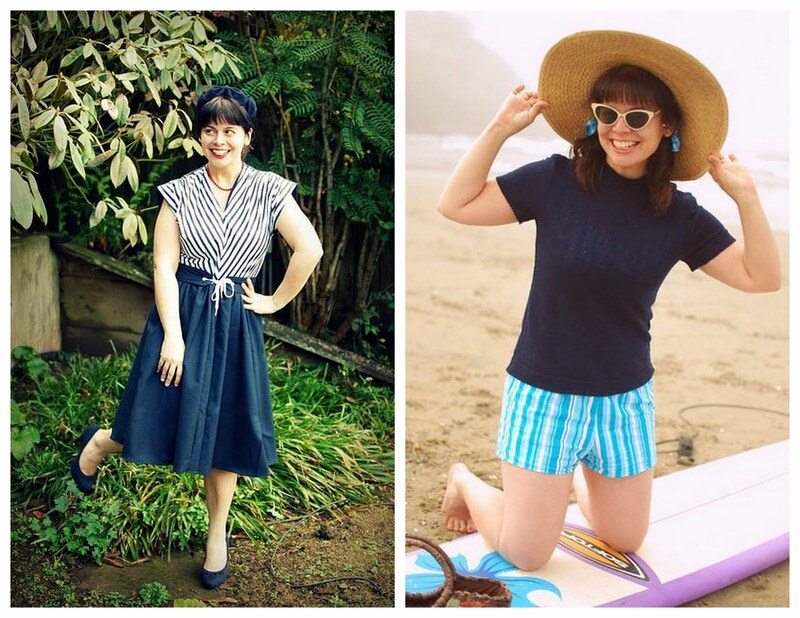 Today's guest will make you wish you emptied your lame closet and fill it with vintage inspired pieces so you can look as stylish as she does. At least, that's how I felt when I first discovered Mena's blog, The Sew Weekly. I had asked another stylish blogger in the blogosphere for some sewing blog suggestions. Mena's blog was one of the first on her list. And I immediately saw why. Photo sources Eat Local Dress, I see Paris skirt top. 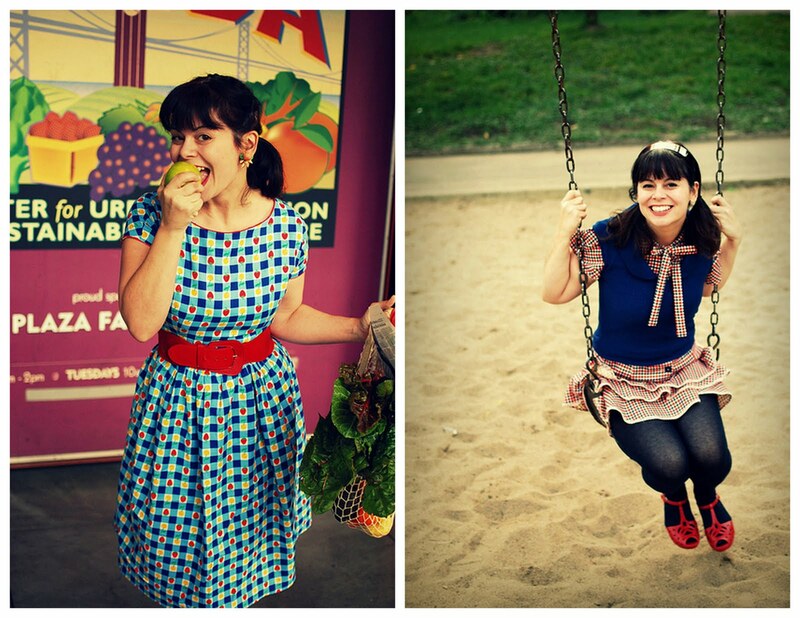 The first thing that will catch your eye is her retro style and yummy photography. Even the layout of her site is good enough to eat! Someone please get me her html template! Love, love, love. 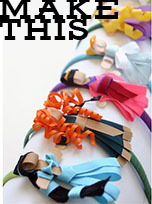 Seriously, it's everything I want Grosgrain to be! But I'm getting ahead of myself! 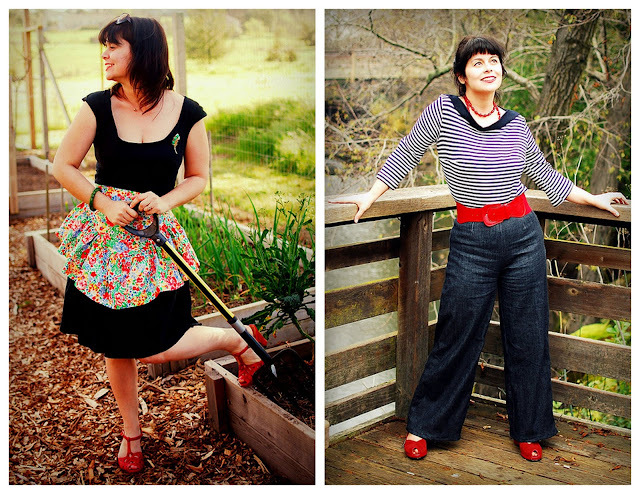 First let me tell you about how 'The Sew Weekly' came to be. 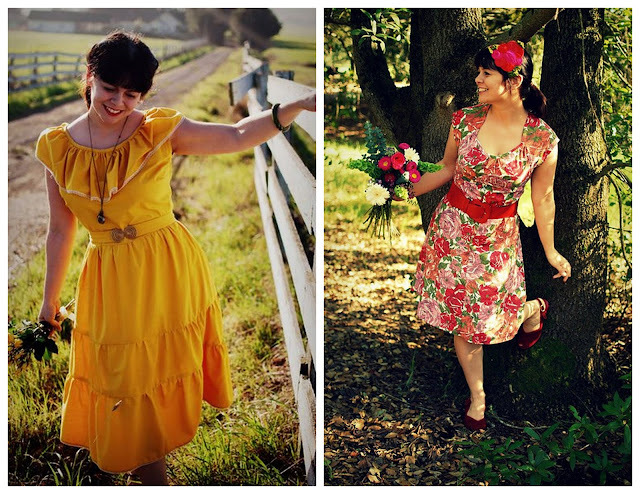 The Sew Weekly first began as an attempt to document Mena's journey into sewing ALL her own clothes. Literally, ALL of them. I hope to have a closet filled only with clothes that I have sewn myself (with a few exceptions). This project began in Fall of 2009 but I began documenting it in January 2010. The Sew Weekly is all about my attempt to meet that goal by sewing something, well, weekly. 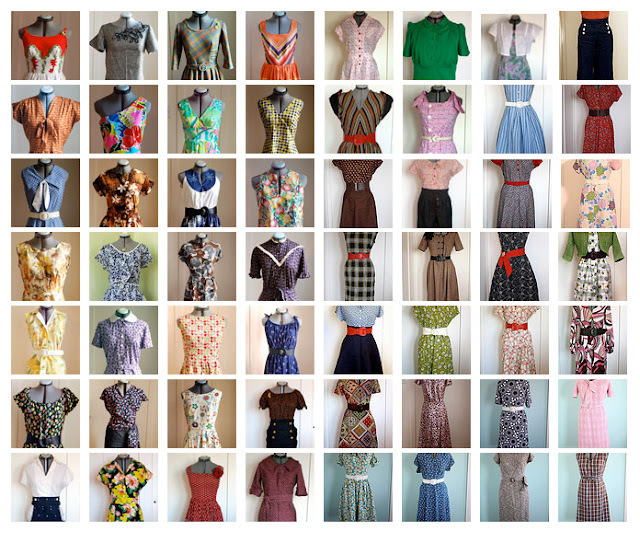 She documented every pieces from price of vintage pattern to price of fabric. Often her dresses were under $5 total including pattern and material! Now, that's a feat! Then in 2011, a large mission of the site is to get more folks involved in sewing and provide a community to share the results. 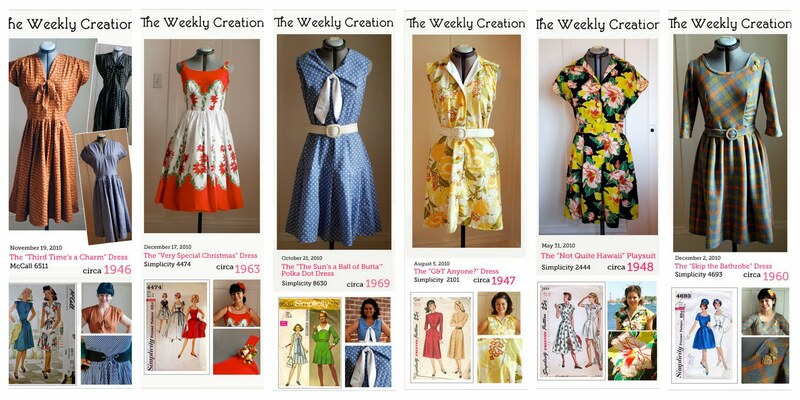 Each week, Mena sets a challenge and the sewing community follows in perfect form! This week, seamstresses are picking a character or illustration from a particularly significant children's book and using it to inspire their weekly creations. Even more interesting, Mena has started 'A Common Thread' project. Being lucky enough to score awesome deals on thrifted and vintage items ($1 and get 400 yards of lace) she used her finds and send a card of 5 yards of that lace to all her favorite sewing bloggers to make something with it. Says Mena, "I just love the idea that we'd all have garments that were all joined with this element. It's kind of like organ donation* (in the sense of one source, different recipients) meets The Sisterhood of the Traveling pants. But not really at all. :) I'd love for you guys to be part of the first project! *but of course, not at all as important as organ donation." 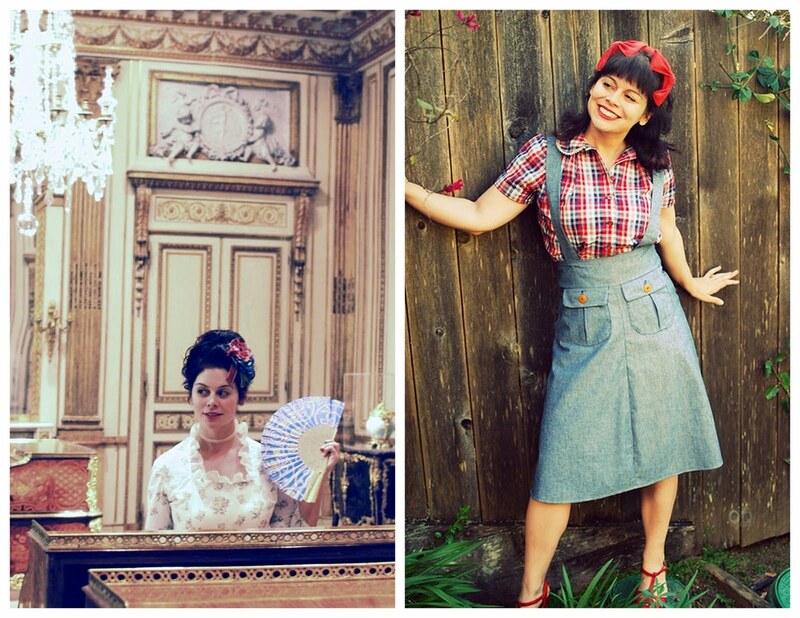 If this is your first time being introduced to Mena and you love sewing as much as I do, her blog is a MUST read! Seriously, wished I lived closer so we could be real-life friends! 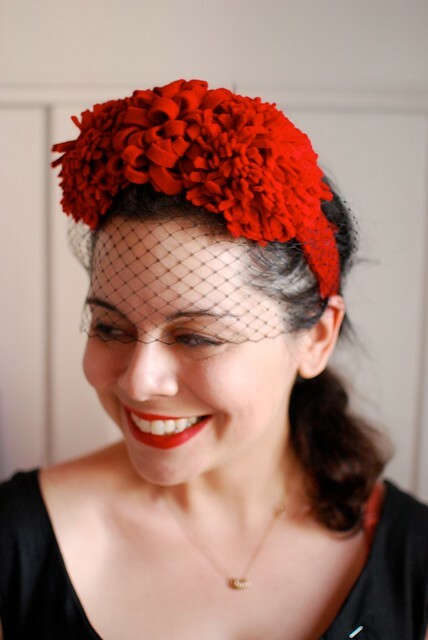 So, please let me introduce the woman behind all my gushings.....Mena and her "1940s inspired floral pom-pom faux tilt hat" pattern! 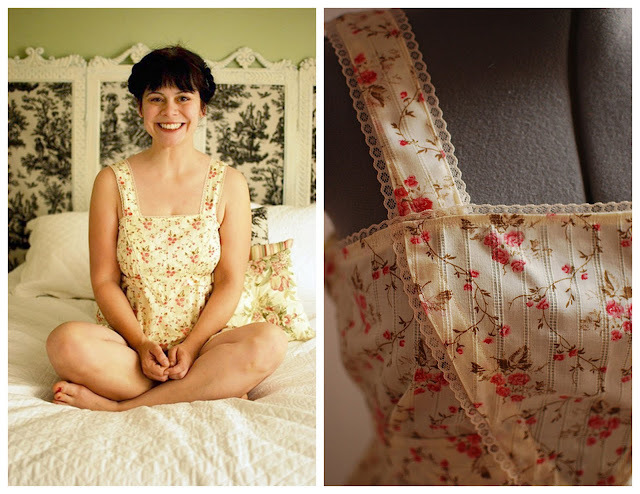 Since sewing my own clothes is "my thing," a garment tutorial is probably expected of me. However, since I rely heavily on patterns myself and don't experiment with drafting, I decided that an accessory would be a bit more in my comfort zone. And because (1) with the Royal Wedding, I have hats on the brain (2) I've been obsessed with hats from the 1940s, it's fitting I present my 1940s-inspired, floral pom-pom, faux tilt-hat tutorial. Now, I love sewing but I'm not ashamed to use a glue gun when the moment dictates. There's no shame in that. With this "hat" (it's really a headband), I wanted to create something incredibly easy but also somewhat true to the era. Sewing is minimal (and could be cut entirely). The real fun will be in the embellishments that you decide to add yourself. 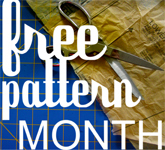 Thanks to Grosgrain (and Kathleen) for inviting me to share this pattern with you! First, cut the felt for your headband. To obtain the width of the felt: measure the width of the headband's widest part, multiply it by two and then add an inch. For the length, use the actual length and add 2 inches. You're going to stitch right close to the edge and then trim off any extra felt. Stitch close one end and the side seams. Be sure to leave one end open in order to slide in the headband. Slide in the headband. Don't worry about turning the headband inside out since the felt is forgiving of the stitching and won't fray. Carefully, stitch the end of your headband closed. Be sure not to catch your needle on the headband. Trim the edges and put aside the headband. Next, you're going to cut the felt for the pom-pom flowers. You will need 4 pieces of felt with the dimensions 1 yard x 2 inches, 1 piece of felt with the dimension 1 yard x 4 inches. Using your pinking shears, cut one edge of each of the four pieces of felt. You're going to use 2 pieces of felt for each of the side flowers. Next, using regular scissors, cut in the ditch of each pinking shear cut. In my illustration, I'm not that precise. That doesn't mean you shouldn't be! Either way, it will work, so if you don't want to be precise that's fine too. Just be sure not to cut to the edge. You should cut to about a 1/2 inch of the edge. Next you're going to roll the first piece of felt like a cinnamon roll. Every couple rolls, use your glue gun and a drop of glue to secure the roll. When you're finished with your first roll, start rolling the second piece of felt as a continuation of your first roll. If you have 72" long felt, you can simply use one continuous piece. At the end of the roll, secure with glue. 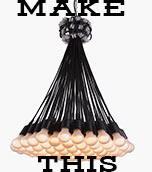 Make the second pom-pom flower in the exact same manner. Now, you're going to make the middle flower. This felt piece should be 1 yard by 4 inches. Fold that piece in half, lengthwise. You're going to cut on the fold, being careful not too cut to the edge (just like the first set of pom-poms). Once the piece is cut, roll just like the other flowers, also securing with glue along the way. Once you reach the end, glue and set aside. Next is the optional step of adding a veil. If you don't want to add a veil, skip the next step. You're going to take the 12" of veiling and hand gather it on one side until it's like a fan. Hold it in place by pinching your fingers in the center. Apply a bit of glue in the center of the headband and glue the veiling in place. Be sure not to burn your fingers with the glue from the glue gun! It will look pretty ugly but that doesn't matter since you'll be attaching the flowers on top of the band. Trim the excess veiling in the back. Now, it's time to glue the pom-pom flowers. Start with the center flower and apply a generous amount of glue to the bottom of the flower. Press it down in the center of the headband and manipulate it so that it tilts a bit forward to one side of the headband. Apply a bit more glue on the headband and use the "petals" to cover any bare spots. You're going to do the exact same thing to each of the side flowers. You're going to glue the flowers on top of the spread out netting. Be careful not to glue the netting to itself. Arrange the "petals" to your liking and you're done! Thank you Mena for sharing your amazing talent with us! I was delighted to have you as a guest on Grosgrain and hoping to return the favor soon! Stay tuned for tomorrow's guest Beth of The Stories of A to Z. How clever! I have a friend and her sole ambition is life is to be Bette Davis. This would make the perfect present for her. 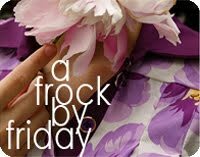 And fantastic blog! 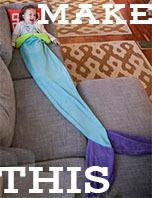 I must make this!!! Fab! So cute! I think I've found a new blog to read. Fabulous tutorial! I absolutely adore those flowers!! What a fabulous idea! Easy to create and looks absolutely wonderful! This is gorgeous! I would totally rock this out and about for a night at the ballet! thanks for the inspiration. i quilt (therefor i am) but have always thought i CAN'T sew (things from patterns). i want to break that nonsense in my head and so will follow your blog and maybe one day... i will break on through to the other side.I also sent link for free Fascinator pattern (made with headband) to my daughter (a hairstylist and DIY crafty girl).